Dr. Steve is a native of the West side of Cincinnati. He attended Colerain High School, Miami University and The Ohio State University. 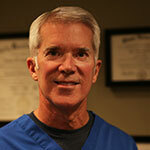 He has been enjoying the practice of Dentistry since 1984. He is married to his wife Kathy and they have five children and two grandchildren. He is a member of the American Dental Association, Ohio Dental Association and Cincinnati Dental Society. He is also a member of the Academy of Facial Esthetics.